Here is a word to make you wise - you can really hit the fantastic favor mark with this owl design bookmark All of us at BabiesBabies love to sing the praises of bookmarks as favors. They're a great size, liked by everyone and they're destined to be used over and over again. So, when we add an adorable design like we did with this precious owl, we know we have a winner. And that's why this little character surely is a wise choice! 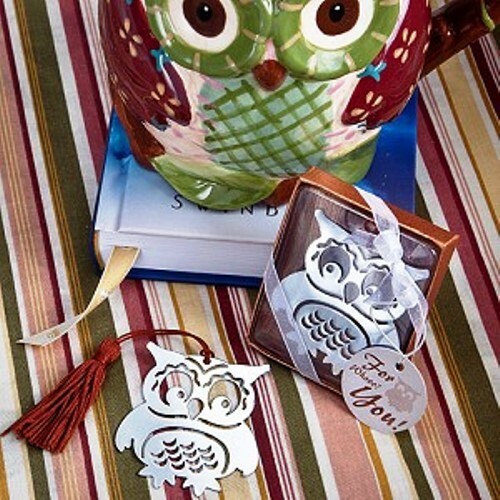 Description and details: Each bookmark favor measures 3 " x 2.5" (6 " long including tassel) The charm is made of silver metal in the irresistible shape of a wise old owl with cutout details including big/friendly eyes, a feather-covered belly and more Attached through a loop at the top of the owl's head is a brown satin tassel The charm of the bookmark creates a page marker that slips into the book at the page you want marked, while the decorative tassel is visible from the outside Beautifully packaged in a clear topped box with a wood grain and brown base Box is tied with a white organza ribbon.